After spending a very pleasant time in Des Moines (I’ll post tattoo pics another day! ), we headed home again. 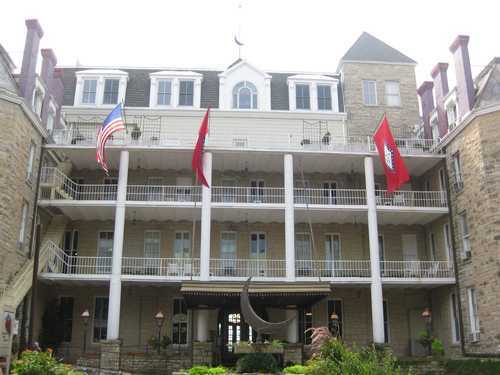 Next destination: The Crescent Inn Hotel in Eureka Springs, Arkansas. It’s one of the most haunted places in America. Ghosthunters episode #13 was filmed there. Wierd things happened even before we arrived. The Crescent lies in the Ozark Mountains and sits on the crest of a hill. We had the address plugged into the Garmin. The GPS worked fine the whole trip, up until the point when it took us up a goat trail of a narrow, gravel road. Halfway up the rutted trail, we met a Hummer. There really was only room for the Hummer, so he had to climb a hill while we squeezed by with our wheels on the edge of the trail. It was a nail-biter staring down the long drop into the ravine. This is the Crescent Inn Hotel. Built in the 1800’s, it’s had many lives—as a resort hotel for the rich, as a school for girls, a cancer treatment-torture facility, and again as a hotel. 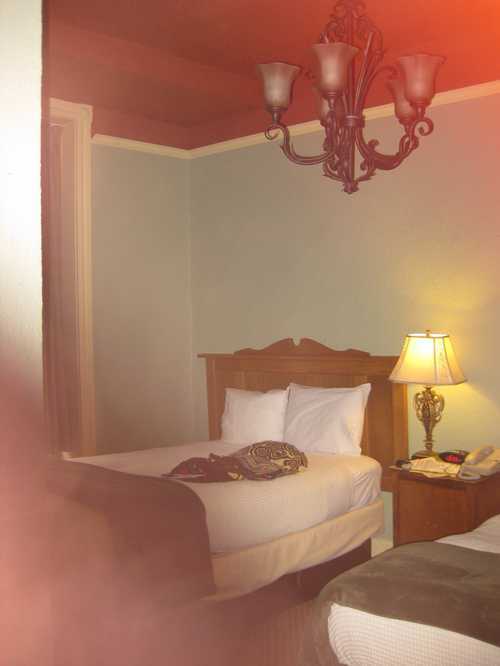 This is our room and the very first picture where creepy things happened. I have a very good little Cannon camera that takes crisp, clear pictures. I took hundreds of pictures on this trip and this is the first one that’s blurred this way. But here, you can make out a shadow. Do you see the outline of a head and shoulder? As it turns out, our room has a ghost that plays outside the door. A child died from a fall and is “seen” playing and “heard” to say “It’s not fair!” when he sees people dressed comfortably because he hated his own fussy clothing.